I've been thinking about Mongolian spots lately. I don't know why....odd thing to think about, isn't it? 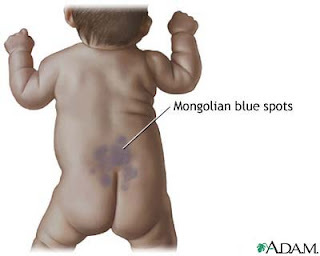 Mongolian spots are irregularly-shaped bluish, slate-gray, or dark brown birthmarks common in Asian, African-American, Native-American, among other, races. At least one Mongolian spot is present on over 90% of Native Americans and people of African descent, over 80% of Asians, over 70% of Hispanics,and people of African descent, over 80% of Asians, over 70% of Hispanics, and just under 10% of fair-skinned infants (Clinical Pediatric Dermatology, 1993). Despite the name, Mongolian spots have no known anthropologic significance, except for being more common in darker-skinned infants. Mongolian spots are present at birth, and most of them fade (at least somewhat) by age two. Most have completely disappeared by age five. If Mongolian spots remain at puberty, they are likely to be permanent. Fewer than five percent of children with Mongolian spots still have any by adulthood. Those who do tend to be the ones with multiple, widespread spots, or with spots in unusual locations. I think that, as an adoptive parent, I will ask my pediatrician to document any Mongolian spots that Kaelie may have and to educate those around her (day-care provider, church nursery workers, etc.) about this harmless condition in order to prevent charges of child abuse or neglect. Well, with Elton John being one of my all-time fave artists, I was so excited that I was finally going to be able to see him in person. My youngest sister had tickets, and she couldn't go, so she sold them to me, and I was going to take my other sister Lisa, in honor of her upcoming graduation from VSU, for a sisters-away weekend. To make a long story short...Elton cancelled on me! I was so disappointed! But, to give him credit, I think he was sick and was on doctor's orders to rest. Lisa and I had a great time anyway! We found a beautiful spring jacket for her to wear on her job interview tomorrow, and I bought a few things for the boys and myself. We got home today at lunch. Now it's on to housework before getting ready for work tomorrow! I found this cute "girly" template at Pyzam. Unfortunately, I don't know HTML well enough to change the template without deleting the widgets. It might take me a few days to get everything back up. The thing I miss the most is my counter! I loved seeing how many of you all out in blogland came to read about this boring life of mine! Anyway, be patient - I'll have it up, and even better than before - within a few days! I've been thinking about baby carriers lately. I bought one at Target a few weeks ago, but I'm not so sure that I'm going to like it. It is very similar to a Snugli and we didn't have a good experience with the Snugli when we adopted the boys. It was pretty much useless. Since David won't be traveling with me to China, I'm really thinking that a comfortable baby carrier is going to be essential on the trip to adopt Kaelie. Even though I've considered luggage and done a lot of preliminary planning (luggage, what to pack, etc. ), getting through airports with a checked bag, carry-on, and diaper bag is going to be a challenge! I've looked at two really nice carriers and I'd love to hear about your experiences with either the Hotsling or the Mei Hip carrier. Here's a picture of the Mei Hip carrier. It has the traditional buckles like a Snugli, but it isn't designed with all those straps. Here is the Hotsling carrier. It is a one-piece carrier with no buckles or straps. Sizing is very important with this sling. If you get it too small, the baby's legs will be squished; too big and the baby is floppy in the carrier. It's sized according to the mom's measurement from shoulder to hip. 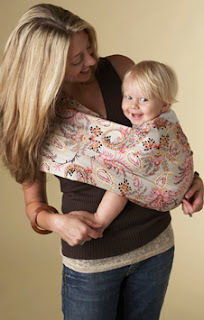 Having read the wearing instructions for both carriers, both look safe and easy to put on and get your child into it. Safety is, of course, the top priority when it comes to anything dealing with your baby. Both carriers seem like they would be light to pack and not take up alot of room. Both carriers come in a variety of colors! I would like to invite you to post comments to this post in the comments section. I want to hear from you before I invest this much money in a baby product. What do you think? I'm happy to report that the CCAA has completed referrals for all 2005 families and has begun January, 2006 referrals! Yeehoo! Referrals were issued through January 4, 2006. We have 44 more calendar days until our 2/17/06 LID. So, with a new batch comes my own new referral predictions! This time, I averaged the the number of days (6.38) for the last 13 batches and also considered the number of RQ poll families. So, I am currently planning on an early September referral with travel in mid- to late November. China Adoption Forecast has us also receiving our referral this year. It was so exciting to see my Precious Pandas buddies receiving their referrals! This is my January DTC yahoo group - I couldn't make through this wait without them!